The only human settlement is Puerto Edén, on the east coast, with a population of 176 inhabitants in 2002. This Native American tribe live and representatives alacaluf (also called alcalufi or kawésqar). Most of them speak Spanish and have now migrated to other parts of Chile in 2006 May with only 12 people who speak their native language fluently, kawesqar, 10 of which live in Puerto Edén . 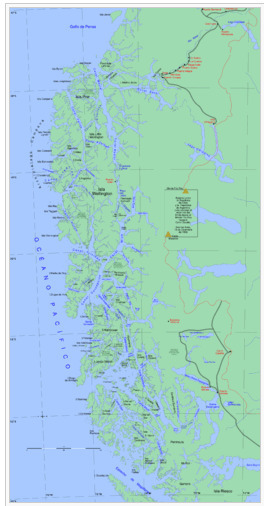 Wellington Island is an island in southern Chile, Magallanes and Antartica Chilena Region (Province Última Esperanza), with an area of ​​5556 km2 (the second largest island in Chile and 106th in the world). Is separated from the mainland to the west by Messier Channel and surrounded by numerous smaller islands in other directions. Most of the island is included in Bernardo O'Higgins National Park in Chile.